Both Moolavar and Uthsavar have Panchayuda(5 weapons). Uthsava moorthy is believed to be made of solid gold. Entry to the temple is through the Big door on the north side as eighteen steps leading to the temple tower (guraded by Karuppu devata) is not opened these days. Noopura Ganga falls is on the Silambaru river and is about 4 kms. from the temple. This water is considered to be equal to Ganga. Thirumanjanam to Perumal is done only with this theertam. The hills surrounding the temple are called Vrishabadri as they look like Vrishaba and cow. During Trivikrama avathara, part of the water that was used by Brahma to wash the feet of Lord passed through the Silambu (ornament worn by dancers on the legs - Gungroo) and fell here and flowed. Hence the river is called Silambaru. Theertham - Noopura Gangai, Silambu river. Nammalwar - 2886-2918, 3733-3744, 3749. Features Noopura Gangai is a waterfall in this Kshetra atop a hillock at about 3 miles. Access to the temple About 12 miles north of Madurai. Good bus facility. The Moolvar found in this Sthalam is Azhagar. 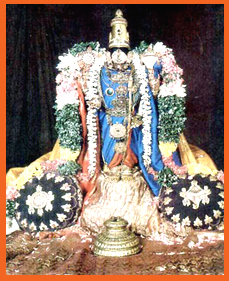 Other names of this perumal are Kallazhagar, Maalangkaarar and Maalirunsolai Nambi. The perumal gave his prathyaksham for Malaiyathvaja Pandiyan and Dharmadevan. Moolavar in Nindra thirukkolam facing his thirumugham in East direction. 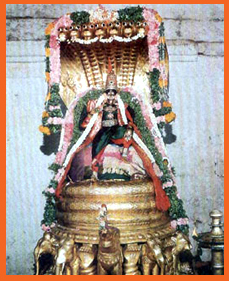 This is one of the divyadesam found in Madurai district, in Madurai the temple is found 12 kms away from the Madurai. Bus facility is available, but there is not much of lodging facility. It is situated on the foot hill of Azhagar malai (mountain).